This new and disruptive technology has taken the industry by storm - delivering the promise of accelerated WAN performance, extended visibility and control as well as a massive cost savings of up to 90%. IDC reports that the SD-WAN market will reach $6 billion by 2020 and independent studies such as the one conducted by Silver Peak and IDG show that 92% of enterprise organizations surveyed will implement an SD-WAN in the next 12 months. Are you ready to jump on board? Confused about how to take the first steps? Join us for an overview of this emerging technology that can not only reinvent your network, but significantly impact your business. Take a look at the first edition of our online technology news series, The SD-WAN Report, brought to you by Silver Peak. In each episode, we are going to bring to you the latest in industry news, technology updates and interviews with SD-WAN customers. In this episode of The SD-WAN Report, Damon Ennis, Senior Vice President of Products from Silver Peak will join us to talk about the upcoming changes in the SD-WAN industry. Then we’ll hear how motorcycle industry giant, Las Vegas Harley Davidson, has deployed their SD-WAN solution and finally take a look under the hood with a technical lightboard demonstration. Get prepared for the latest in SD-WAN and Industry trends heading your way in 2018. Watch industry expert and Silver Peak Founder & CEO David Hughes deliver his annual predictions for the future of networking in his annual on-demand Crystal Ball webinar available now. Silver Peak EdgeConnect enables building a highly available and resilient branch architecture with its active-active cluster. No single point of failure on the LAN, WAN or appliance side. It brings the simplicity, operational efficiency and cost effectiveness of SD-WAN to the design. Deliver best application performance, availability and reliability over any transport including consumer broadband. Forward error correction, tunnel bonding, integrated WAN optimization (Unity Boost), and SaaS optimization are some of the key features of the Unity EdgeConnect SD-WAN solution. Learn more about the Silver Peak SD-WAN Solution Unity EdgeConnect. First-packet iQ enables organizations to reach cloud-based applications, SaaS, IaaS and trusted web traffic directly to the Internet from branch offices. Unity EdgeConnect SD-WAN solution First-packet iQ feature intelligently identifies applications on first packet & dynamically steers traffic to its destination on an app-by-app basis. Securing applications no matter where they reside is a key requirement for cloud-first enterprises. The Unity EdgeConnect SD-WAN solution has built-in stateful firewall and simplifies integration with security ecosystem partners. It enables orchestration of app-driven security policies leading to securing sites quickly while reducing errors, faster response to threats and automated app security. Learn more about the Silver Peak SD-WAN Solution Unity EdgeConnect. The Silver Peak EdgeConnect is purposefully engineered to power today's cloud-first consumption of enterprise applications. The thin branch consolidates and orchestrates the consumption of network functions like SD-WAN, BGP routing, WAN optimization, firewall while protecting current infrastructure investment. 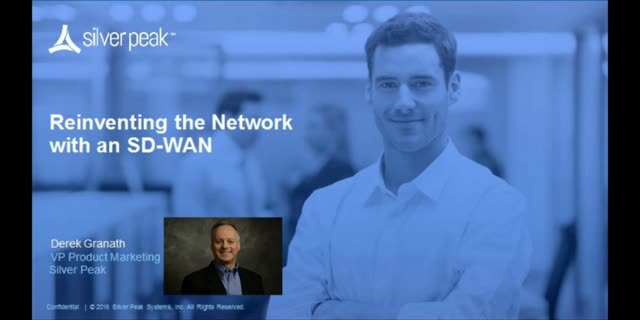 Flexible migration from legacy routers to SD-WAN. Unity EdgeConnect gives you the option to replace routers altogether, integrate with existing routers and appliances, and/or interoperate with legacy sites not yet SD-WAN enabled. Learn more about the Silver Peak SD-WAN Solution Unity EdgeConnect.